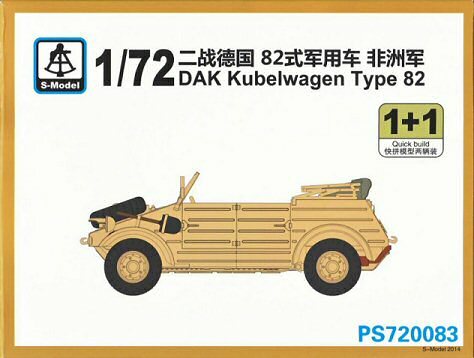 Finally, a Kübelwagen in plastic with balloon tires! I have been waiting for this for a long time, and S-Models have delivered. But is it any good? 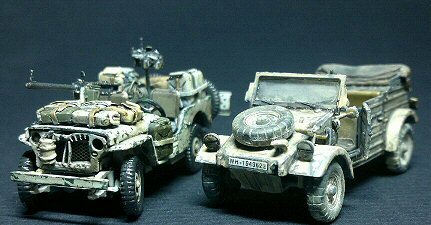 Compared to other 1/72 plastic Kübelwagens, I think it is the best out there. The Dragon Kübelwagen is also very good. It even has some points were it is better than the S-Models version. The Dragon model has some better details, for example gas and brake pedals. It has an engine. The air filter on the back is correct, where the one from the S-Model is only half an air filter. S-Models did this to make room for the folded tilt. But on the down side, the Dragon model has separate tires from the rim. When they are put together they look horrible. They let the whole model down. If the model had single piece wheels like most models do, this would be the best Kübel. There are, what I think, map holders on the doors, something I have never seen pictures of. But that does not mean they did not exist. The trouble I have with it, is that the doors cannot be built without them. There is no inner detail on the doors. And the biggest problem, for me, is that it comes with a Tiger 1. That makes for an expensive Kübel, if you just want a Kübel alone. So, to the S-Model kit. I made some changes to the model. S-Model has made a mid-version of the Kübel. I wanted to build an early version. An initial version is harder to make, because the patterns on the doors are different. There are some other differences, but the doors would be the hardest to correct. I started with improving some details. Pedals for the driver, legs for the seats. And I replaced the PE bar in the middle with a plastic rod. The tilt got replaced with one made from green stuff, and on the back I added a round taillight. I did not use part A-12, the air filter. It was not that often installed and because it lacks the top part. But this can easily fixed. And if you use the supplied tilt, the missing part is hidden. I installed a fuel tank next to and a little behind the instrument panel. 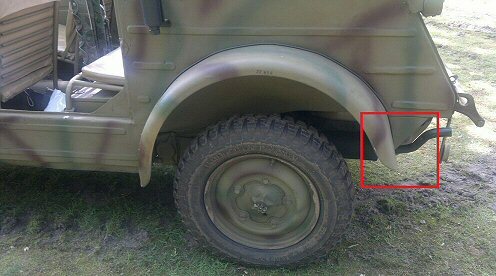 If you want to further detail this area, there is a jerry can placed underneath it, but this can hardly be seen, even on the real vehicle. See the reference photo. I also added some window wiper motors to the window frame. Making an early version of this kit is very easy as well. The rear fenders need to be cut. At the end they were shorter. 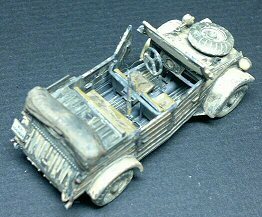 With the early version the end where also the body of the car ends. Later versions had the fender extended below the body, probably to keep the dust from being kicked up. The indicators were attached to the window frame. The horn (A-6) is moved from the front to a position just in front of the driver’s door. 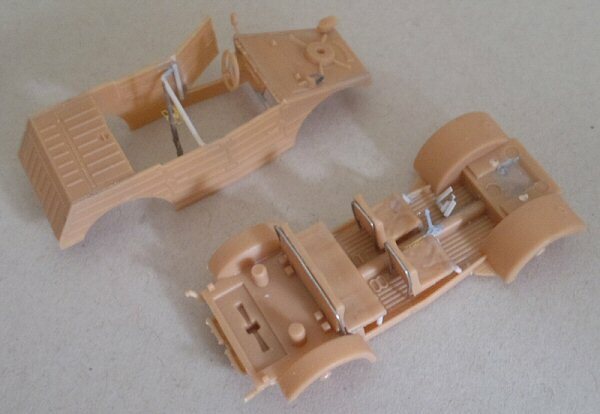 Missing from the kit is some clear plastic for the window, which easily can be made from any clear plastic packing material. Also there are no decals, which is a bigger problem (and a letdown for me). Both things are included in the Italeri kit. So I took those from the Italeri Kübel. S-Model offers only one colour option for the kit, but this sells the kit short. The Tankograd book, "Kübelwagen on all Frontlines", is a perfect reference. 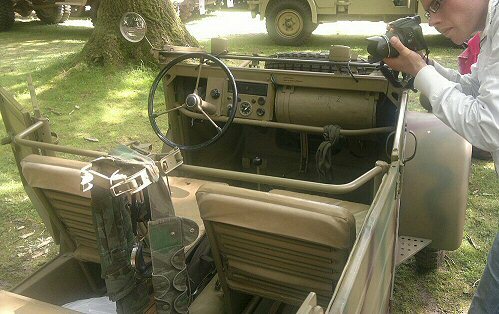 There are pictures in the book of Kübelwagens with balloon tires in panzer grey, in panzer grey with sand overspray, sand yellow, three and two tone camouflage in Italy, and in olive drab for captures ones used by the Brits and Americans. The balloon tires gave great traction on loose sand, but they did not last very long. They wore down very quickly. So you can build a mid-version from the box without changing the kit, something I plan to do with the second kit, and give it a three tone camouflage. 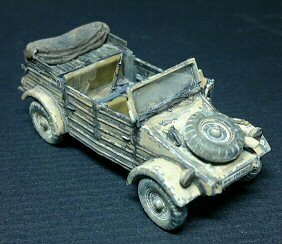 I have not found any pictures of a late Kübelwagen, with balloon tires. But I plan to make one, using the other S-Models kit, with the “normal” tires. The biggest problem is that the instrument panel needs to be rebuilt. The late version has a square instrument panel. And there are some more little changes. When I get around to it I will try to write something about that build as well. As you might have guessed, I really like this grandfather of the Porsche 911.